In this post we will discuss confluence alternatives. Confluence a Atlassian’s tool is the collaboration software which has been a favorite for most of the enterprise for over decades. The Atlassian collaboration tool confluence is sold as on-premises or software as a service product. This Software is coded in the Java language. On 25 March 2004 Atlassian first launched the Confluence as a tool to provide a management system require knowledge and also an active wiki along with its course. Over the year confluence has evolved into a more significant collaboration platform, but as the years go by people search for a new and different solution. Before we get to this new and different confluence alternatives , let see why is there a need for a change. 1. Many teams are switching to Slack from HipChat, so it doesn’t make much sense to continue with Atlassian HipChat Confluence. 2. In any group or any company not everyone has the technical knowledge, and so the non-technical folks always seem to struggle with confluence. So, if want to make your team or organisation efficient, then it may be the time to switch to another alternative. 3. Everyone like to use tools that are easy to handle and understand like Gmail, Dropbox, Facebook and all. People using these devices don’t ask many questions which in turn make your company better. If people are not engaging much on confluence, then it time to change this software. Some of the best Confluence alternatives. What every team looks forward to is the perfect collaboration between the team and that is possible only through collaboration tools that are easy to use. Nuclino is one such software tools solutions that provide a fantastic partnership between the team members. Nuclino collaboration tools have some great, powerful features like multiple groups and multiple dashboards for the dedicated projects also many other applications that make the team collaboration high. Currently, Nuclino is in the trial version, so it is available for free to all the users. The team behind this software Nuclino is always looking forward to the feedback from its users to make Nuclino even better in the future. Sadly, this application is still not available on any mobile platform. Even though it is in the trial phase, the Nucleo is integrated with some powerful channel platforms like YouTube, Vimeo, Soundcloud and Spotify that make things, even more, more comfortable for the teammates. Whenever a new user registers in Nuclino, that at the first start with an introduction video giving details about its every feature. According to use this is one of the best confluence alternatives. G Suite is one of the best confluence alternatives. Developed by Google is a band of cloud computing, collaboration and productivity tools, software all acquired by Google. 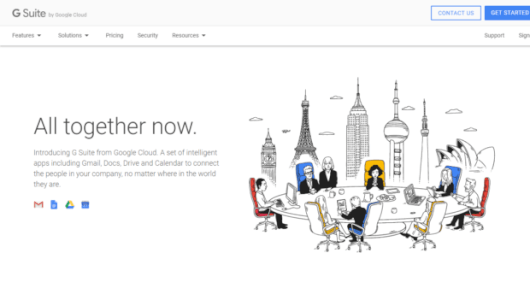 As Google developed this G Suite, it naturally would have all google tools like Gmail, Calendar, Hangout, Drive, Docs, Sheets, Slides, Sites, Jamboard and Vault. Everything in the G Suite is connected to the cloud, so a need of internet is always required if not then your employee might get cut off. There might be still some issues in this software, which software doesn’t have. But that’s not a reason to leave this software. If you have a small business or are a Start-up, then this software might be excellent collaboration tool for use as who doesn’t know how to use simple Google apps. In the upcoming future, there are sure to be more new features in the G Suite that will undoubtedly become a better option for your organisation. The G Suite has the most attractive premium account offers that range for different tires and versions. A professional or a business suite range from $5 to $10 per users, which is relatively in the budget for everyone. Huddle is another confluence alternatives. Huddle is comprehensive collaboration software that is integrated collaboration, file sharing and project management software. 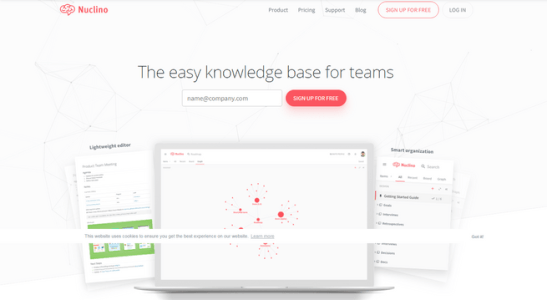 Huddle is cloud-based collaboration software that provides a seamless interaction with the third-party business app and systems like SharePoint, Okta and others. They also offer enterprise-level collaboration, high-level management version system, secured account logins and reduce dependency on IT support. Making a connection with other teammates without hindering the safety and security and collaborating with other is the highpoint of this software. Huddle makes the organisation create, manage, control and communicate with each other on the team simple, more straightforward and quick. Huddle keeps the whole team on the same page by coordinating everyone to the latest document version. Also, this software allows the users to see who has gained access to your document and managed the access permission for your papers. With the Huddle mobile app, you are connected with your team even when you are on the go. Huddle bids several services for Small Businessmen and Enterprise level users. These services have a variety of offers starting for $20 to $50 giving a minimum of 15 user access and max up to 100 users. Most of you would have heard of Dropbox, a simple file sharing and cloud storage software. Dropbox has been around now for a long time but hasn’t be presented any editing or collaborating software. 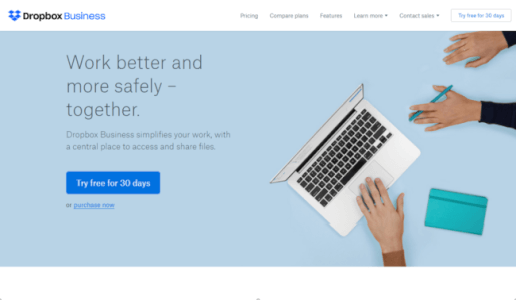 Dropbox in the past has teamed up with Microsoft to create and offer editing and collaborating tool, but this didn’t gain much of the success. So, later Dropbox came up with the solution and produced Dropbox Paper. This tool offers many and variety of features, create official papers, to-do lists, assign tasks, share, edit and chat simultaneously, search for documents, store various versions and keep files in sync across all devices, even on your smartphone. There are also some essential formatting tools available that when you write code or add image automatically gets formatted. You can also get the attention of people by mentioning their name in the paper document as @username. When you say their name, they either get an email and desktop or mobile notification. The Dropbox paper has a real-time collaboration that allows members to see edit happen in real time. With Dropbox Paper you can collaborate with all your organisation members. If you have a business account of Dropbox, then the paper comes with particular sets of security to keep you safe at arm’s length.